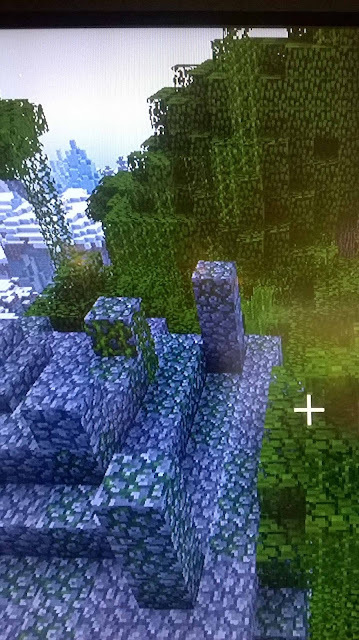 Minecraft is split up into little areas of land called biomes. 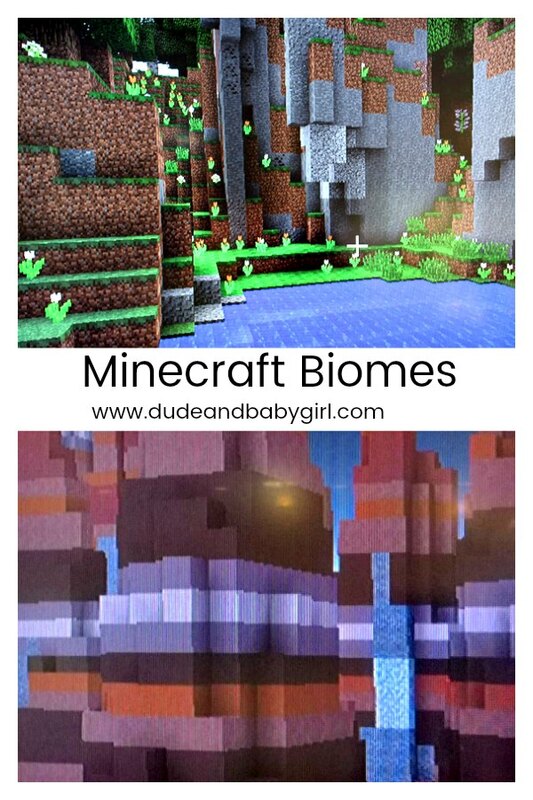 Each biome has different structures, mobs and general appearances. Plains are biomes that have very little or no trees. Lakes, lava pools and caves are often found in plains. Plains can be useful for farming because of the abundance of grass. Is this biome suitable for a base? This biome is great for a base on the edge, next to forest, because if you built a base in the middle of one, you would be making long trips for wood. Forests are biomes that consist of oak and birch trees, a LOT of them. Unique features: Wolves live here, but that is not unique. Is this biome suitable for a base? Yup, with all that wood this is the place to be. Deserts are large areas of sand with cacti and dead bushes growing on the surface. Unique features: Husks (Husks are a type of zombie that only spawn in deserts). Is this biome suitable for a base? Only at the edges by a forest. Jungles are biomes that consist of very large trees and an abundance of ferns and vines. Is this biome suitable for a base? Yup, with trees that size you will have piles and piles of planks. I would recommend either building a tree house or a house on the jungle floor next to a lake. For easier access to the lake you can make a deck that extends into the water. Taiga are biomes that have very little life and not much food. Tall ferns are found here. Unique features: Rabbits and wolves live here, but that is not unique. Is this a biome suitable for a base? It's okay, there is plenty of wood, but you might want to import in crops. The snowy taiga is just like a regular taiga except that, well...it is snowy. Unique features: Wolves and rabbits live here, but that is not unique. Is this biome suitable for a base? No, all water for farming freezes. Extreme hills are pretty much mountains. You can often find caves, waterfalls and lavafalls in or on them. Unique features: Llamas and emerald ore are found here. Is this biome suitable for a base? It's okay, but there are no trees. One idea is to collect saplings and find a alpine lake just under the snow line. Plant the saplings to make a small forest up there and then build your base. Mesa biomes are fairly rare and spare of life except the monsters that come out at night. Cacti and dead bushes grow on the red sand. Unique features: Red sand and sandstone. Is this biome suitable for a base? Only on the edges. Savannas are dry biomes that get very little rain. 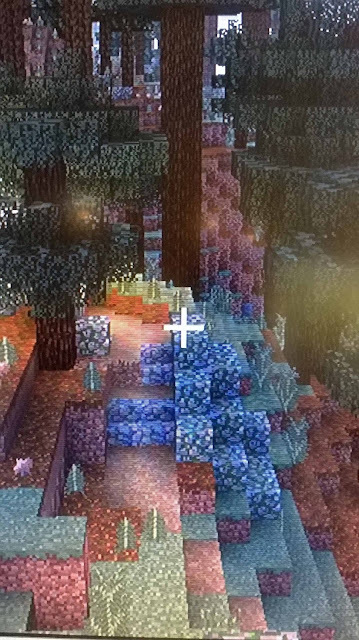 The bent up trunks of the acacia trees provide orange wood that you can use in your builds. There is a lot of grass for wheat. Unique features: Acacia trees grow here and llamas live here. Is this biome suitable for a base? It's okay, there might not be enough trees though. Swamps are biomes that consist of oak trees, lily pads, mushrooms, and flowers. Little pools of water are scattered all around the biome. Unique features: Lily pads, and slimes spawn here. Is this biome suitable for a base? It's okay, but you might want more trees. Mesa plateaus are like mountains inside mesa biomes. They are made up of hardened clay. You can sometimes find mineshaft entrances on the sides of mesa plateaus and gold is found at all levels here. Unique features: Gold is found at all levels, and this is one of the only places you can find hardened clay. Is this biome suitable for a base? No, there is no wood and building on the plateau can be difficult. 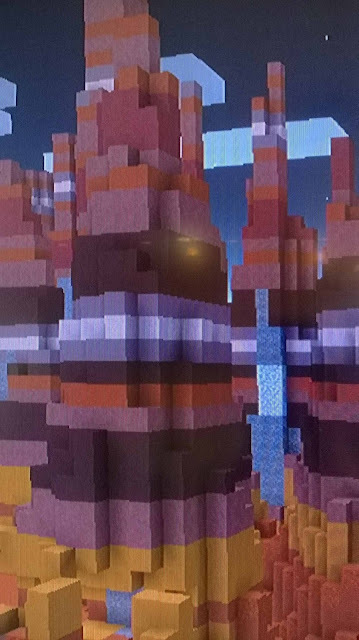 Bryce biomes are a rare version of mesa biomes with giant pillars of hardened clay all over the place. Unique features: None, though the pillars are really cool looking. Is this biome suitable for a base? No, there is no wood and it is hard to build due to the pillars. Roofed forests are very lush forests named for their canopy of leaves that cover the ground like a roof. Giant mushrooms, as well as dark oak trees, grow here. Dark oaks are not the tallest trees, but they are the widest. Most trees are one block wide. Giant spruce and jungle trees are two blocks wide, and dark oaks get up to five blocks wide. Dark oaks are by far the widest trees. Unique features: Vindicators, evokers, and vexs live here. Is this biome suitable for a base? It is good if you like to fight monsters day and night. The leafy roof blocks out enough light so monsters can spawn. A birch forest is pretty much just like a regular forest, except there is no oak trees and only birch trees. Is this biome suitable for a base? Yes, there is a lot of trees and some space. You just better like the color of birch planks. The flower forest is the prettiest biome in my opinion. It is like a regular forest, but with a whole lot of flowers added. If you take a flower forest and add some hills and lakes, like in the picture below, you get a real pretty setting. Unique features: Lot of flowers. Is this a suitable biome for a base? Yes! There are a lot of trees and you can make lots of dye from the flowers. Mega tiagas are one of the most interesting biomes in the overworld. Giant spruce trees loom over the small mossy cobblestone deposits. Podzol, as well as grass, cover the forest floor. What's really interesting about podzol is you can grow mushrooms on them in broad daylight. Unique features: Mossy cobblestone and podzol. Is this biome suitable for a base? The only food commonly found is rabbit meat and mushroom stew, so you will want to avoid living here. 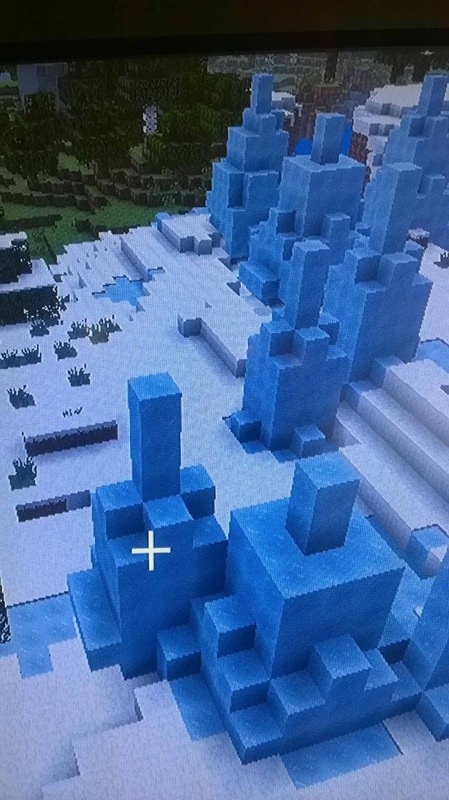 An ice spikes biome is kind of like a snowy taiga, just replace the trees with huge spikes of ice. The spikes' height can range from a small nine blocks tall to around a whooping fifty! The few living creatures here include polar bears, rabbits, and strays. Strays are a type of skeleton with glowing white eyes and tattered iron armor. They shoot arrows tipped with slowness at you. 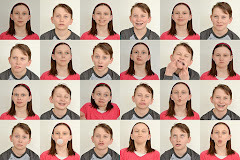 Unique Features: Snow blocks, ice blocks, Polar bears, and strays. Is this biome suitable for a base? Not at all, there is no wood and water freezes. Ice Plains are biomes covered in ice and snow. Grass is commonly found peeking up out of the snow. You can sometimes find a few spruce trees. Unique features: Polar bears and strays. Is this biome suitable for a base? Although sugar cane grows here, farming is still hard because water freezes and there is little in the way of wood. Rivers are strips of water running through different biomes and in to the sea. Is this biome suitable for a base? Not in the river. On the bank is okay, depending on the biome. Beaches are biomes that include strips of sand running along ocean sides. Unique features: Turtles lay their eggs here. Is this biome suitable for a base? It depends on the biome it is by. Oceans are biomes that hold tall mountains and deep crevasses under the water. Sometimes the mountains get so tall they reach out of the water forming islands. Bright coral reefs and kelp forests house fish and dolphins. Unique features: Squid, guardians, dolphins, turtles, drowned, and all types of fish live here. Structures found: Ocean monuments, sunken ships, and underwater cities. Is this biome suitable for a base? No, unless you build an underwater base. Crevasses are large cuts tearing the landscape around them in two halves. Coal and iron can often be found. If the crevasse is deep enough you might find gold, lapis lazuli, redstone, diamond, and emerald. Structures found: Mineshafts, dungeons, and strongholds can intersect crevasses. Is this biome suitable for a base? It depends on the biome. Do not build inside a crevasse! Building inside a crevasse removes you from resources such as wood and food. You can make an emergency base inside a crevasse, but I would recommend building a base on the ground above and have a mine in the crevasse. Caves are little holes and tunnels winding under the ground. Lot of monsters can be found in caves. If You are walking through a plain in the middle of the day and you hear a zombie, but can't seem to find it, it is probably in a cave under your feet. Caves can hold every ore in the game in tunnels, so they are great for spelunking. Structures found: Mineshafts, dungeons, and strongholds can intersect caves. Is this biome suitable for a base? It depends on the biome. Never build inside a cave. Mushroom island is an island inhabited by red and white cows called mooshrooms. Giant mushrooms grow on a gray grass called mycelium. What really stand out about the island is that no monsters spawn at night here! Is this biome suitable for a base? It does not have trees and the only food is mushroom stew, but who can resist no monsters! Just make a high speed railway to the mainland and you will be all set. The nether is a dark and fiery land where everything wants to kill you. You can only reach it by portal. Netherrack covers the ground, as grass would in the overworld. Lava, fire, and glowstone light the dark landscape. Only one type of ore is found and that is nether quartz ore.
Is this biome suitable for a base? Not really, although is it possible. The end is a cluster of floating islands in an empty space of nothingness called the void. The main island is where the ender dragon lives and where you will appear after you jump into the portal. The main island consists of a ring of pillars made of obsidian with the exit portal sitting in the middle. Just outside of the ring is the portal to the outer islands. The outer islands are a cluster of small islands one thousand blocks away from the main island. To get there and back you must throw a ender pearl through the portal. Is this biome suitable for a base? It's okay, if you don't mind transporting materials there. Now you know all of the biomes in Minecraft and what they contain in them. What biome will you build your base in and which ones will you gather treasure in?